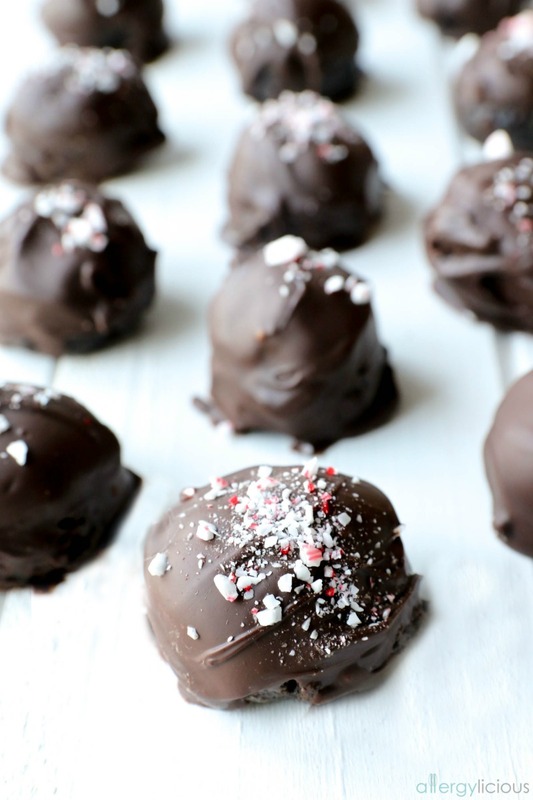 Sweet dreams are made of these: Easy, Vegan Oreo Truffles made with only 3 ingredients. This Oreo Truffle recipe originally posted in 2016 before our name changed to Allergylicious. It comes back to you today, revised with new photos & a new make-over. 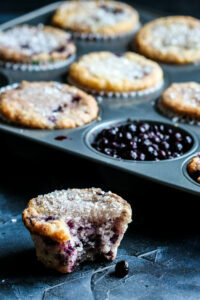 One of the things that I love about allergy-free baking is the challenge. I enjoy taking a recipe that is known and loved and turn it into a treat that my son, and others that share his allergies can have. I also love being able to hear my friends rave over something and then hear their shock when I tell them it’s vegan. Did you notice in the title it says “Oreos”? Oreo cookies are vegan, which means they are free of dairy and eggs as well as any other animal products. Now don’t mistake vegan for healthy, however, it won’t kill my kid, and so in that terms, it’s healthy enough. (I used regular Oreos, but read the labels, because some DO contain milk and may be in a facility that also produces peanut products). Oreo Truffles go back a long time; I couldn’t even tell you where it originated from or who gets credit for the original recipe. You may have seen them served on a platter at a party or may have even tasted one (or 3) before. Basically, it’s crushed Oreos, mixed with cream cheese then coated in chocolate or candy coating. Tastes amazing, but absolutely NOT what you want to hand anyone with food allergies or certain restrictions. Here’s where I come in…. making this something you now CAN eat. 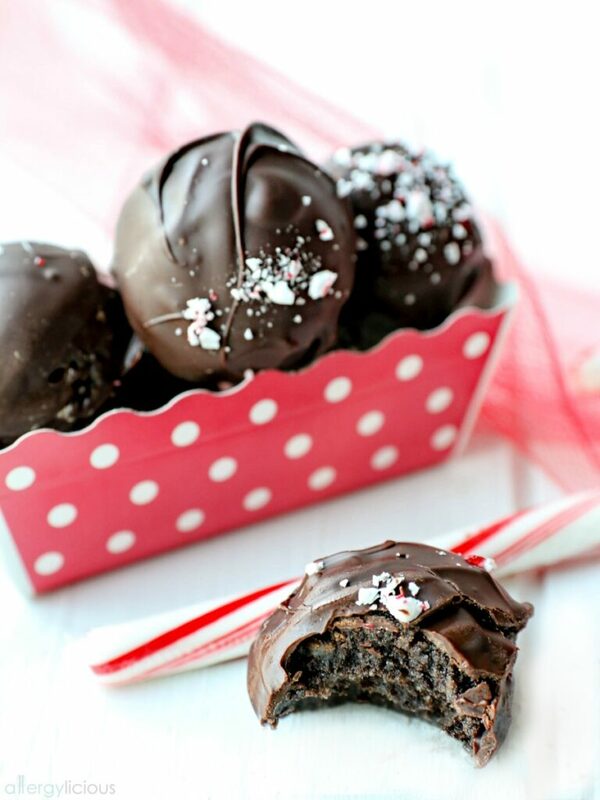 Oreo Truffles with only 3 ingredients. In a food processor, pulse cookies into a fine crumble (like you’d crush graham crackers when making a crust). Stir in the softened cream cheese using a sturdy spatula. Roll dough into 1” balls and place on wax paper covered sheet. (You may need to freeze 10 minutes before moving to the next step). Melt chocolate in 30 seconds intervals until nice and smooth. 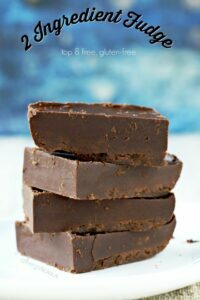 I like to add a teaspoon of coconut oil just to keep the chocolate nice and shiny. 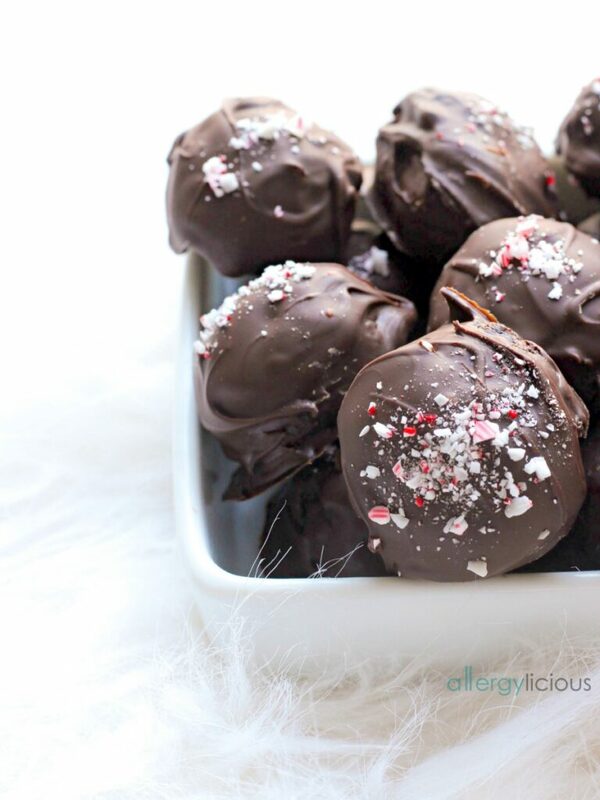 Dip cookie balls into the chocolate, tap off excess chocolate and set aside on a wax paper covered cookie sheet. Decorate with sprinkles, crushed peppermint or edible glitter …because who doesn’t love glitter? 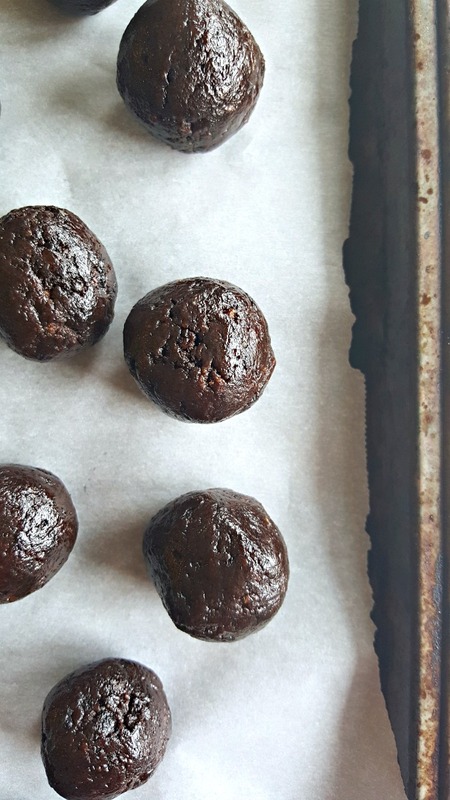 Now you can make your own, Delicious, Raved about, Dairy-free, Egg-free, Nut-free, Vegan, Oreo Truffles (see why I didn’t call it that in the title?). 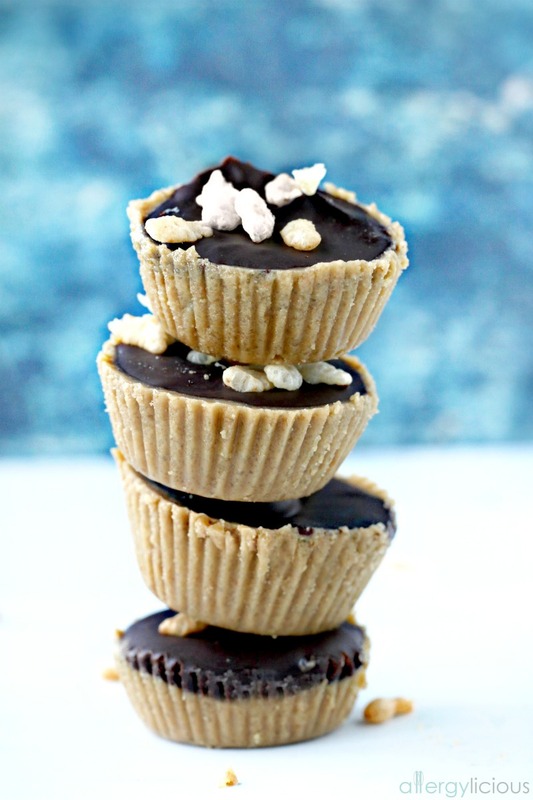 Don’t forget, you can make these Gluten-free & just as delicious! In a food processor or blender, finely crush cookies into a fine consistency. 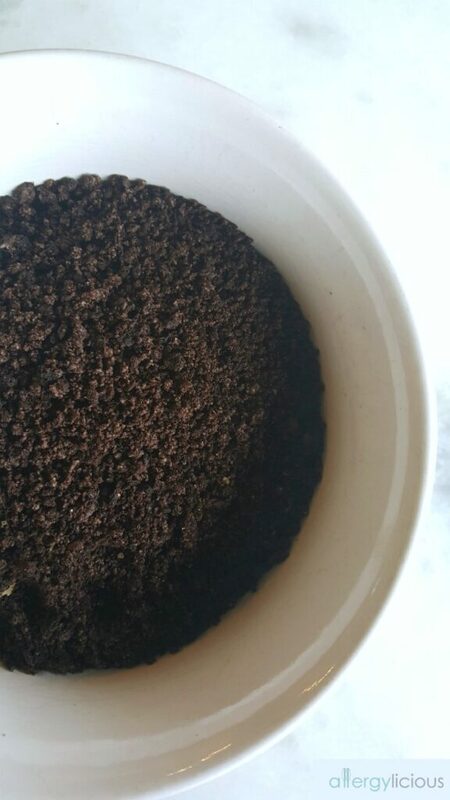 Pour into a large bowl. Stir in softened cream cheese, using the spatula to press the two into each other to create a nice dough. Roll the mixture into 1″ balls and set aside on a wax paper covered cookie sheet. Melt your chocolate chips (start with half a bag) in the microwave for 30 seconds. Stir and heat again in 15 second intervals until melted. Stir in a small amount of Coconut Oil to keep chocolate nice and shiny. 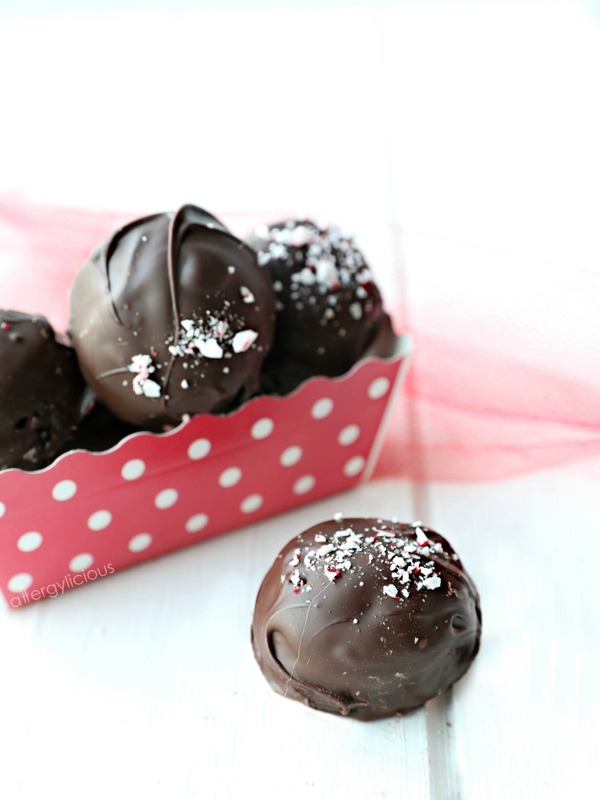 Dip Oreo Balls into melted chocolate, tap off extra and set aside again on the wax paper. Continue until all are covered in chocolate, melting more chocolate if necessary. Sprinkle with any decorative sprinkles or crushed cookie if desired. Refrigerate to all to set (15 min) then serve. If dough balls seem to soft, freeze 15 minutes and then dip into melted chocolate. 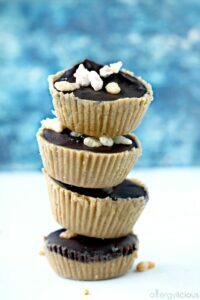 Do you have any favorite treats from childhood (or adulthood) that you’d like to make “allergy-safe” or Vegan? I’d love to hear about those in the comments below. Who knows, maybe I’ll even include those in an upcoming post for you! As always, you can find me on Facebook, Instagram, Twitter or Pinterest for more recipes & food allergy/vegan shares. I should not be left alone with these! Nope not a safe situation I used to love these things, I never thought how easy they would be to veganize. Great idea Nicole! 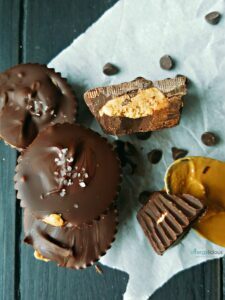 Laura, I actually have a recipe for SunButter Cups (and you can use PB if you prefer) but those turned out wonderful. It’s an older post so the pics aren’t as pretty but they sure are delicious. ahhh – one of my favorite desserts, EVER. so rich and lovely – yours look fantastic and I love the peppermint on top! This is such a classic recipe that I always forget about! Good to know it works deliciously with dairy-free cream cheese alternative too! These look delicious! 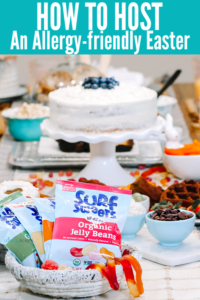 I love taking classic treats and making them perfect for everyone and oreos are a classic! That’s what I have fun doing as well. Its not always creating something new, just creating something safe and just as delicious. I can see these becoming very dangerous around me, haha! I love making things that everyone is able to enjoy!! Oh yes, I have a few still hidden in the fridge and seem to enjoy 1 with my coffee in the morning. Dangerous indeed. You are right, that would be great to give to teachers. 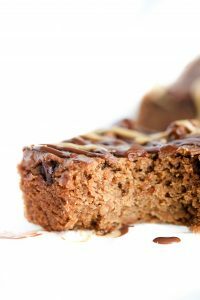 Yum – looks great and love that it’s only 3 ingredients! Thanks for including the gf option – ktoos are so good! We make them GF for friends, so I it is nice having that flexibility. Thanks for the note of Ktoos. We just have to avoid eggs as well, so sometimes that’s hard to find something that fits all the allergens. Hi! I really want to make these as gifts, do you think I could freeze them until Sunday/Monday without them getting weird? Or do you know how long they will keep for? They will last for at least 2 weeks if refrigerated. At least that is how long mine have lasted since I made a huge batch and hide the extras in the back :). Freezing them would be another great idea, just refrigerate the day you’ll be serving to let thaw without getting melty. These look so decadent! I can’t believe that it’s only 3 ingredients. OMG! These look so so delicious and beautiful. Can’t believe I missed this recipe for the holiday season but hey anytime can be truffle time right? Of course I’d go the gluten free and can’t wait to give them a try! Better late than never and you’re so right…you can eat this anytime you want . You’ll have to let me know how it works with your GF flour too!